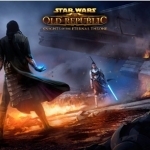 AUSTIN, Texas--(BUSINESS WIRE)--BioWare™, an Electronic Arts Inc. (NASDAQ:EA) studio, and Lucasfilm today unveiled the world premiere of the new ‘Betrayed’ cinematic trailer, revealing a first look at the prequel story for the upcoming expansion Star Wars™: The Old Republic™ – Knights of the Eternal Throne. The new digital expansion will be available for download on December 2, free* to all subscribers of Star Wars: The Old Republic, and will offer an exciting starting place for new players to begin their saga. Knights of the Eternal Throne puts the player at the center of their own explosive battle to rule the galaxy. As the Outlander, a veteran of the Great Galactic War, players will have the power to make their mark based on their light and dark side choices. Stakes are high as the player faces the most powerful villains in the galaxy including Emperor Valkorion and Empress Vaylin, as you lead the fight to take control of the Eternal Throne! Ruling the galaxy offers expanded power and influence through the new Galactic Command system. Alone or with friends, players can ignite light and dark side battles, face all-new erupting confrontations known as Uprisings, and unlock powerful rewards. In the latest expansion, players will be able to customize their combat encounters with three challenge levels, giving everyone the option to play their way. BioWare also announced pre-order rewards for Knights of the Eternal Throne. Players who are subscribed to Star Wars: The Old Republic by October 25 get the infamous mercenary bounty hunter, Shae Vizla, as their companion. Those subscribed as of November 27 can rise above their enemies in the new Rapid Recon Walker Mount – stay subscribed throughout the entire period to receive 3-days of early access to the expansion. For more information on the Pre-Order Rewards, visit: www.StarWarsTheOldRepublic.com/Eternal-Throne. 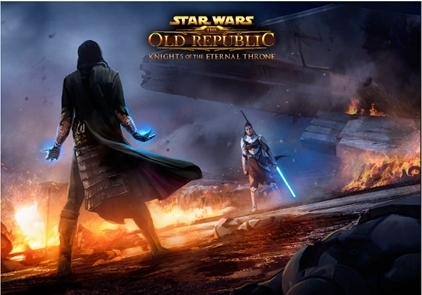 Star Wars: The Old Republic is a Free-to-Play*, award-winning BioWare Online RPG set thousands of years before the classic Star Wars movies. Players team up with friends online to fight in heroic battles between the Republic and Empire, exploring a galaxy of vibrant planets and experiencing visceral Star Wars combat. For more information on the Star Wars: The Old Republic Digital Expansion, Knights of the Eternal Throne, please visit www.StarWarsTheOldRepublic.com/Eternal-Throne. Visit www.StarWarsTheOldRepublic.com/Play-Free to try the game today. Join the conversation by visiting the official Community Blog, Facebook, Twitter, YouTube, Twitch and Instagram. For additional press assets, please visit http://info.ea.com. LucasArts, the LucasArts logo, STAR WARS and related properties are trademarks in the United States and/or in other countries of Lucasfilm Ltd. and/or its affiliates. © 2013-2016 Lucasfilm Entertainment Company Ltd. or Lucasfilm Ltd. All rights reserved. BioWare and the BioWare logo are trademarks of EA International (Studio and Publishing) Ltd. EA and the EA logo are trademarks of Electronic Arts Inc. All other trademarks are the property of their respective owners.